Dr S. Sivaraman is probably the longuest running contributor of FXStreet, providing his forecast the beginnings on our website. And he has been presenting webinars on FXStreet for more than 10 years now. Very recently, he moved from webinars on Webex to shows in our Live Video Youtube Channel. He still presents the same: market analysis and forecast during the Asian session based on the algorythm he developed. That is twice per week: on Monday for trading calls and forecasts and on Friday for a review. Make the acquaintance of Dr S. Sivaraman with our interview! Dr Sivaraman, please tell us who you are in a few words. I did my Ph.D in applied Statistics and served as professor for 28 years under Madras university, Chennai, India. During my post doctoral research work, I developed the forecast algorithm explaining the direction, trend, trend reversal and swing levels of the currencies for the time frame of every 30-min to session wise, intra-day, weekly , monthly, yearly and multiyear’s. Besides I provide intra-day, weekly monthly, yearly and multiyear trend reversal timings and levels, and the timings of the shift in trading zones for the currency conversion trades investment banking of high net worth and Financial institutions since 1998. Can you explain us a bit more about the model you created? My forecast is derived by a sequential statistical analyses – an algorithm – which was derived during my post Doctoral research time. I was able to prove how the extraneous market influencing factors – traders greed, surprise and fear – the herd mentality are influenced by the Electro- magnetic impulses coming from various planets during specific time frames which are inducing the Hormonal system of human.They in turn induce emotional decisions and distress trading. Hence my forecast gives the session wise expected market moves , type of trade-sell and buy or buy and sell, and times to enter and exit with levels to make trading enjoyable. How did your research became famous? I started in 1997 and when I promoted my forecast 1998 through my website i-knowindices.com, many traders and institutions started taking and found the reliability. My forecast was first promoted by Forexdirectory.net. Then Mr. Francesc Riverola of FXstreet gave a nice boost to my forecast. Then I was asked to do managed accounts by many traders, that is how I started my trading mostly as opportunistic trader. Followed by that, other websites also asked me to give forecasts like Forextv.com or IBtimes.com. I always take buy position near the day’s low or sell position near the day’s high and keep 30 pips hedge order to limit the risk as basic trading strategy. Whenever the market momentum indicates potential quick stop hunts, I wait and take counter trade sell near the new high or buy near the new low when they are not breached for more than 10-30 minutes. Trend reversal swing trades ( aiming 30-45-75 pips profit) are done during month end and new month beginning weeks. During mid months, I do trending trades aiming 200-350 pips profit using trailing stop and trailing limit order in profit making positions .In all these trades initially hedge order is used to limit the risk in open position , once the position makes 25 pips profit, hedge order is removed and stop is placed at entry. Later to maximize the profit trailing stop and trailing take profit orders are used. I trade mostly in EUR/USD and GBP/USD as they give lots of volatile moves for either way trading using hedging orders. Besides I do trade in USD/YEN, USD/CHF ,AUD/USD and USD/CAD when turnarounds are seen. I rarely trade in crosses as the risk is more than rewards in my way of trading as many days we may see one sided moves. I start my market observation from 02:00 GMT and continue till 17:30 GMT with frequent intervals of 20-30 min for my other activities. I do leisurely trading without complications, using only the live market quote page, forex calendar and read available news and market comments from various websites including FXStreet. What can traders get by attending your Asian Session Live Market Analysis show? The session offers forecast with timings, expected range in which the 4 majors and 2 commodity pairs could swing, how to finetune the forecast using the market reading – noting down the initial lows and highs for the day by 03:30 GMT and relate the levels during different times of the sessions and day with them to understand the types of market moves the currencies could make to take appropriate trading decision. Besides, I provide strategic trading guidance using hedging in loss making position to limit risk and trailing stop and trailing take profit limits to maximize profits. Live trade calls are given in selected currencies based on their spreads with entry, exit and hedge /stop orders limits..
Before hosting them on YouTube, you have been presenting these sessions as webinars since May 2009. What do you enjoy most about hosting them? I’m giving the most reliable forecast for small traders who may not be able to subscribe to any paid forecast services, but who still want to earn after making unbearable losses. Being a professor I enjoy teaching my market readings, the true intentions of big players trading, and caution small traders not to become victim of their act. So once the the necessary skills involved in the market are understood by the small traders, the market fear goes off, then wise trades come as insight for such traders. I wish to see that the traders develop their methods of understanding and trading rather than depending upon some experts who mostly give excuses for many unexpected events. I am doing it as a service to small trader community with joy of guiding. FXStreet was aggressive since 2001 in promoting forex related services. From their beginning I was asked by the CEO of FXStreet, Francesc Riverola, to provide the intra-day and weekly forecasts using exclusive updatable page. And homepage display based on frequency of update. From 2003 Ms. Claire was moderating (at that time) the Q&A Chat session which we were giving twice a week. Then I gave the suggestion in 2002 to display forecast and market comments from many other experts and analysts as a unique place for the visitors to get a consolidated market info. The immense response and contributions from financial institutions and banks made FXStreet to grow to the top of the world website. I also associated myself in a collaborative project with fxstreet. In 2005 I started giving webinars on different topics moderated by Ms. Noemi. From 2006, I run the most popular ‘market reading ‘ blog which was later transferred to ForexStreet.net, the network. Then from 2007 Ms. Maud and Ms. Vicky were moderating my “Asian session live market analysis” and “Tracking the forex market together” twin webinars. Now since October 2015 Mr. Mauricio is moderating my Asian session: live market analysis and forecast webinars twice a week besides some flash webinars for 15 min giving calls for spike trades (opportunistic trades). FXStreet has undergone multi fold changes in focus, concept presentation, and revenue models. I’ve been sailing along through the tide with pleasure and good connectivity. My website i-knowindices.com provides comprehensive trading solutions giving the different time frame, converting loss making positions into profit making endeavour using the forecast. Due to a very busy schedule, I am not posting my forecast anywhere and I spend most of my time giving exclusive consultancy work to corporate, financial institutions and bank dealers for their currency conversions, forward covers etc. To receive email notifications before all the shows presented by Dr Sivaraman on FXStreet, follow him! All our shows are recorded. 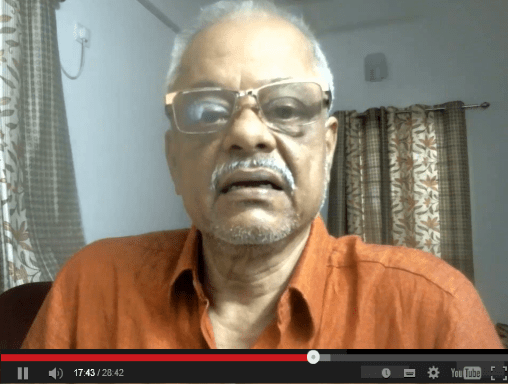 You can replay Dr Sivaraman’s in his archives.